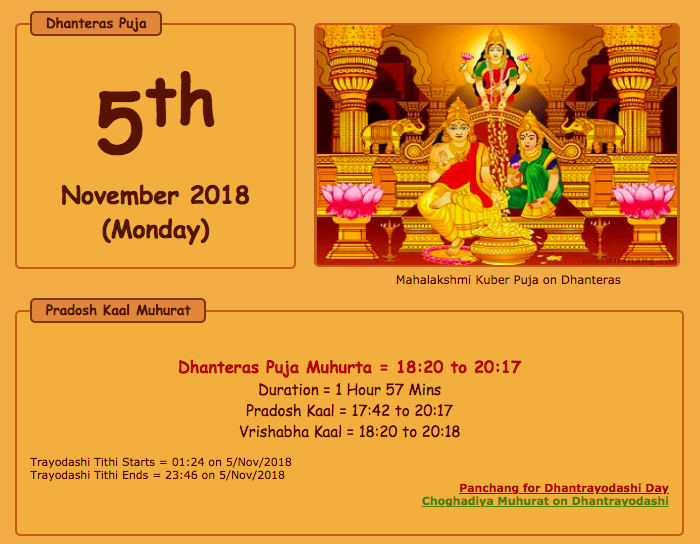 Dhanteras Puja Vidhi Muhurat 2018 – Time, Date & Calendar | Dhantrayodashi: For quite some time, Dhanteras has been taken as an important date in the Hindu Calendars. Dhanteras has a long historical significance but with the growth of economy and affluence of the people, the festival has become a major event for celebration. In the present time, Dhanteras Puja Date has great relevance in the minds of common Hindu no matter wherever they live, in India or abroad. The festival is also is called “Dhanvantari Trayodashi” or simply as “Dhantrayodashi”. The festival of Dewali which is celebrated for five days began with Dhanteras. Dhanteras is a union of two words. The first word is “Dhan” which means wealth and resources and the second word “Teras” is the thirteenth day as per the Hindu calendar. Actually, Trayodashi is the thirteenth day in the Krishna Paksha which is the dark phase before Amabashya or total lunar eclipse. From the early stages of civilization human endeavor is basically focused on gathering wealth and different resources to support human life. In this endeavor, we worship the goddess Lakshmi and god Kuber to get the highest level of prosperity in life with our family and close ones. The suggestion for the worship is to achieve wealth and prosperous life. All the action of a common Indian began with the worship of the deity of that particular action. As we worship Saraswati for education, Shiva for health, etc. Likewise here we surrender to the blessings of Lakshmi and Kuber who are the god and goddess of enormous wealth, riches and affluence. People have a belief that something or the other must be purchased on this day to welcome the blessings of the Almighty. It is believed by the Hindu devotees that on this day Mother Lakshmi had come up when the gods and demons were churning in the milky ocean to obtain immortality by claiming Amrut or nectar. Amrut is considered to the source of immortality. In our life, the sustenance is no way possible without wealth which is quite comparable with the Amrut. Hence on this day worshipping Goddess Lakshmi is believed to bestow wealth and prosperity. It’s time to send Dhanteras advance wishes. you can get the best Dhanteras advance wishes from here. Though Dhanteras is related with the worshipping of Lakshmi and Kuber for wealth, it has another very important significance. To achieve real success in life we have to secure our health otherwise the whole effort goes in vain. On this day, many observe Dhanvantri Jayanti. Dhanvantri as per the Hindu mythology is considered as the god of medicine. As Lakshmi, Dhanvantri also emerged from the milky ocean while the gods were churning with the demons. Dhanvantri emerged in the last in the process of churning with a pot containing Amrut or nectar. Actually, Dhanvantri is another incarnation of Lord Vishnu. So along with the worshipping of Lakshmi and Kuber people all around India and wherever they have spread out worship Dhanvantri for the real happiness of life. Naturally, if one has the wealth and health then life has to be convenient and smooth with happiness all over. This year as per the Dhanteras Puja Calendar the auspicious Dhanteras would be celebrated on 5th November which is eventually Monday. So keep on reminding yourself about the day and arrange everything required for the perfect rituals in advance before the day. A tremendous religious enthusiasm of Hindus can be observed in the celebration of Dhanteras. The ideal and perfect time for the worship is considered to begin after the sunset and that last for 2 hours and 24 minutes. So be prepared for the Dhanteras Puja Vidhi Muharat. This time, after the sunset, is termed as Pradoshkaal which is the sandhi muharta and an ideal time for worship. The first thing that the devotee needs to perform is to get the idols of Lakshmi and Ganesha and other items required for the performance of worship. After getting all the requirements from the market the devotee needs to worship with full sincerity and devotion with the other members of the family. One very important matter must be taken into consideration while getting the idol of Lord Ganesh is the trunk must be curved on the right side. Let us now check once the actual Dhanteras Puja 2018 time or muhurta for the worship. It is quite natural that one should maintain all the basic necessities in worshipping on this auspicious occasion. But observance of Dhanteras Puja Vidhi brings real prosperity and well being when the devotees pray with full faith and devotion. You may know that the Pradosh Kaal begins with the appearance of stars in the sky. All the members of the house gathered in the Puja room for the worship. Though in most houses it is seen that only the ladies are performing worship but if the male members join then the celebration gets a different dimension. Remember some important items (samagri) of Dhantaras Puja. Along these, the devotees have to arrange several other items as guided by the priest. To begin the puja first lit the Deepak or Diya in Ghee and Agarbatti. As per rule first, do puja of Ganeshji Maharaj. Then after completing Navagraha puja do Avahan of Lakshmiji and recite mantra with full devotion. After completing the worship place five Deepak in Kitchen, Drawing room, Bedroom, Washroom and any place in your house. Lit many more Diyas and place them in different places of your house. After the puja younger members should touch the feet of elderly persons in the house and take Prasad with great reverence for Ganeshji, Lakshmiji, and Dhanvantri.